Has BlackBerry finally turned its back on PlayBook? BlackBerry may have finally drawn a line under the embarrassment which is its PlayBook tablet, as the firm was unwilling to discuss plans it may have for the slate. At BlackBerry's annual conference last year the firm appeared bullish about the PlayBook, happily confirming that it would bring the new BlackBerry 10 platform to the tablet sometime in 2013. Roll forward 12 months to now and the picture isn't as clear cut, with BlackBerry not revealing its BB 10 plans for the PlayBook - or even confirming if it's still going ahead. 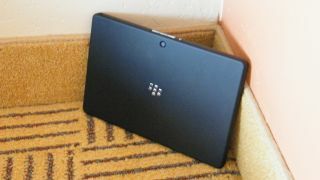 TechRadar spoke to Vivek Bhardwaj, Head of Software Portfolio at BlackBerry Live in Orlando about the possible update and he said: "I can't provide any further information on that at this point. "We are still assessing what we want to do with regards to tablet as a strategy as a whole. "Our vision is still very much centred on mobile computing and we believe that the smartphone is the end point and you'll want to connect it to other things." However there was a glimmer of hope for anyone still hoping to get BB10 on their PlayBook with Bhardwaj rounding off his comment by saying: "Stay tuned, there will be [news] updates I'm sure, but not at this point in time." BlackBerry is keen to drive home the fact that it's completely focussed on mobile, as today's smartphones have all the power you need. Bhardwaj explained: "For us other hardware are just other end points. If you look at what you've got on your smartphone the processing power and capabilities of them are pretty much on par with your laptop. "The only thing really missing is a larger display and perhaps a larger keyboard, so it's not completely out of the question to look at how we can take what we have on our smartphones and extend it to a wider environment. "When Thorsten [Heins] talks about the smartphone being that one device to share across everything it's genuinely because we've got to that point now where the smartphone has the power. "You don't need to have five or six other devices with the same spec all at different sizes, you just need peripherals." Although Bhardwaj wouldn't be drawn on commenting on future products it could mean that BlackBerry is possibly looking at tablet and monitor docks to accompany its smartphone range, in a similar vein to the Asus Padfone and Motorola Atrix.